Wednesdays around here are typically reserved for “Adoptables”. 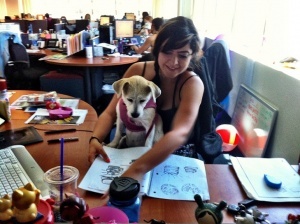 But, when I realized that Take Your Dog to Work Day celebrated dogs AND adoption…well. Pet Sitters International, the world’s largest educational association for professional pet sitters, (Barks and Blooms is a member) started Take Your Dog to Work Day in 2007 to celebrate dogs, to encourage adoption from humane societies, shelters, and rescue clubs. This year, the 15th annual TYDTWD is Friday, June 21. If your business is participating, let us know about it! PSI sponsors a photo contest that you can enter HERE. Check out last year’s winner! This sweet rescue named Beverly and her owner won a $500 cash prize and $500 to her favorite shelter or rescue. Woot! 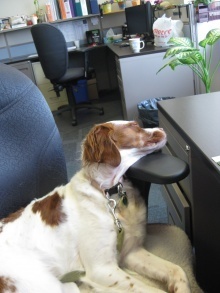 Here’s the 2009 winner Holly, napping at the department of motor vehicles. Can’t blame her; I get sleepy waiting for my number to come up, too. Enter your dog in the contest–and if you do–let us know! It’s open until July 31, winners to be announced at the end of August. te, but it has to be on a Wednesday–we’ve got you covered. Celebrate Take Your Pet To Work Week™ any day during June 17-21.